"The Eye of Providence" (also known as the All-seeing Eye) is a symbol that exists in many cultures around the world. The oldest usage of the symbol appearently dates back to ancient Egypt. In Western iconography, an eye, enclosed by a triangle, have historically been used as a symbol of the Trinity. During the 18th and 19th century, the symbol, together with many other aspects of western art and iconography, was introduced to the Orthodox Church. These Russians are simply envious of the Serbs, Georgians, and English. Yes. That is the Ancient of Days. A non-canonical icon if I have ever seen one. It's such a shame that it isn't canonical. Many of those I've seen have been most pleasant on the eyes, especially the one in the parish I knew as a child. Normally, I'm not one for conspiracy theories but the tale of a Tsar who faked his death to become a righteous pauper saint? That is not something I can just ignore. Maybe I'm simply gullible and naive but the moment I heard about it, I became a true believer. Well, I think Ancient of Days is OK (if I'm remembering my LBKology right) when depicted as Christ and not as the Father; it's the triangle halo that's improper in this one. So apart from the halo shape, I'd say it's fine because the icon has the "ho on" in the halo, thus this icon is depicting Christ as Ancient of Days - not the Father. I'm not sure though if Ancient of Days icons have to depict Christ in the typical blue over red clothing, so that may be another issue with it too. In short it may be canonically deficient, but I'd imagine it's still venerate-able even by somewhat stricter standards. The eye in the triangle may have come into use in Orthodox lands, but it is unacceptable in iconographic terms. I've always been uncomfortable with it. I try and comfort myself with the words "all-seeing eye" which come up in the priest's prayer at the bowing of heads at the end of the Orthros (and, of course, the accompanying prayer), but it is of little use. You're almost right, Nephi. Christ can be depicted as the Ancient of Days, dressed in radiant garments, bearing the halo with the nine bars and the name of God, and with white hair and beard - but He should bear the inscription IC-XC, as is the case in the more commonplace icons of Him. That makes me wonder then, is IC-XC more important in an icon of Christ than the ho on? The depiction of Christ is good, but the icon is spoiled by the inscriptions of the Evangelists' names next to the four heavenly creatures surrounding Him. While the creatures mystically represent the four Evangelists, naming them in this way is wrong. Sts Matthew, Mark, Luke and John were all human beings in essence. St Luke was not an ox, St John was not an eagle, etc. Sorry, I didn't see the picture come out. I think I can tell what you mean, though. The fresco I posted dates from the 12th century, when the halo was just as likely to feature jewels, as this one does. The three letters of the name of God began appearing in the halo at about this time, and quickly became the norm. It is not acceptable to omit the title IC-XC. If you're trying to distinguish between a proper icon of Christ and an inappropriate icon of the Father, then yes, it certainly is. The Ο ΩΝ is technically descriptive of Father, Son, and Holy Spirit, but IC XC is only descriptive of Christ. 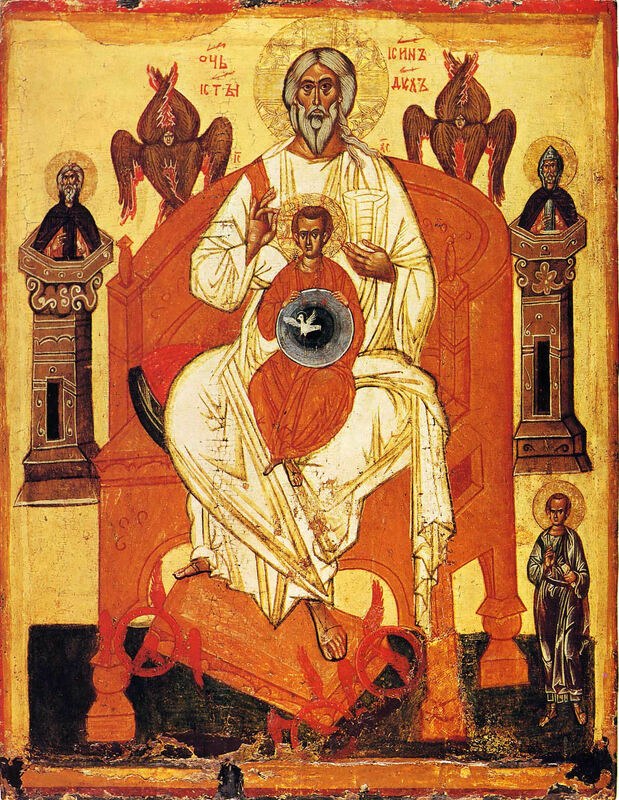 You'll notice that in the icon in reply #1042 the Ο ΩΝ is missing, but it's obvious (9-bars of the halo cross) that the icon depicts a member of the Trinity; the IC XC solidifies that it is depicting the Son in the pre-incarnate form of the Ancient of Days of the revelation to Daniel. Which browser are you using? It shows up OK on Firefox. I still can't see it. I was using Safari on my phone. Thanks, though. Aha! Now I see it. Thanks. The icon that I was referring to had a triangular halo and no IC XC inscription. 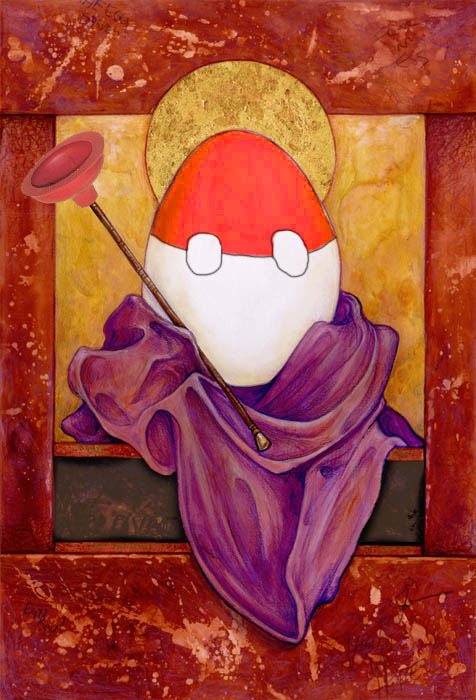 If this was a depiction of God the Father, it is uncanonical. Unfortunately, such depictions do exist in domes of churches done in 19th century style. However, they might hopefully be replaced. Not really. Monument laws etc. At least here. I have no real intention of getting rid of it. Sue me. Rather disturbing. The Father has blue eyes, but the Son has brown. Where did the Father get his recessive genes? Mor, I fear you have fallen to prelest. Repent while there is still time. That ship sailed a long time ago, at least according to some. Is the Spirit a male, female or androgynous in that pic? Also, why does the Father have His beard tucked into His cloak? It would be blasphemy to fully depict the true awesomeness of the beard. There was a Council about it. I'm pretty sure the Spirit is a woman's head budding from the back of a dove in flight (no doubt trying to escape). 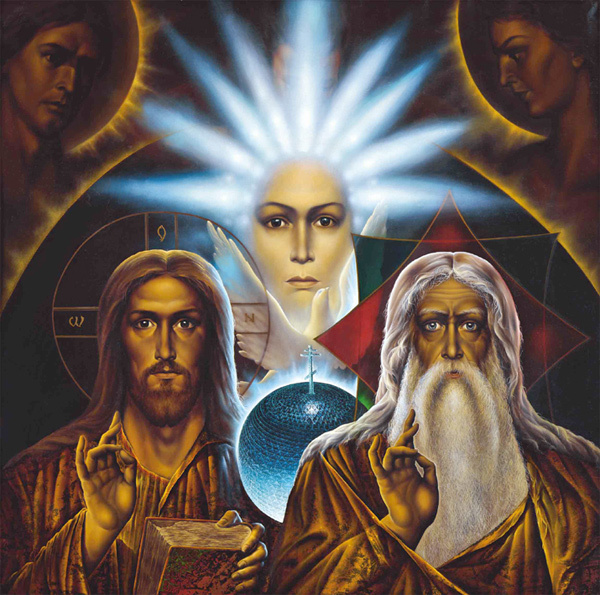 Okay, the second picture, that woman/holy spirit/whatever it is/ reminds me of Alex Grey's "Sophia" which, if you paid attention in Gnosticism 101, she was supposedly the goddess of wisdom. I have heard some people try to say that the Holy Spirit and Sophia are in fact one (just so we are clear, I disagree with that), so maybe that's what the artist was shooting for? Where does the Father and the Son get their self-tanning? It's ghastly. Also, why does the Father bless with the Name of Jesus? And here I had thought that the Prosopon school had simply made it all up themselves. Glad to see that they're at least not that far gone. Again, this is such a potentially attractive piece of imagery. Uncanonical and theologically deficient? Sure, but attractive nonetheless. Unfortunately, "attractive" does not trump "correct theology". Would you find a hymn or prayer tweaked to reflect an opinion or stance at odds with what the Church teaches acceptable, as long as it sounds good to the ears? Think about it. And devotees of the Prosopon school aren't the only ones recycling the Paternity/Otechestvo image. Oh, yes, it's been in my schlock file for some time now. Ghastly. No, no, certainly not. I don't support the production or propagation of any such images and neither do I consider them acceptable in the slightest. It's just that when I look at them as simple pieces of art, not that icons should ever be reduced to such, they're not necessarily aesthetically ugly. Proper theology must always take precedence and what appeals to my fallen eyes need not matter in this regard. I'm pretty sure someone posted this one a few pages back.